Make Oyaki Dumplings at Ogawa Village’s Zenkoji Shop. Ogawa no Sho is based in Ogawa Village, the legendary home of oyaki dumplings. 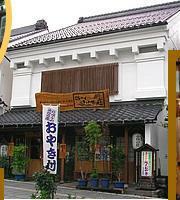 Their Patio Daimon is conveniently located steps from Zenkoji Temple in the heart of Nagano City. Learn how to make oyaki dumplings from the Ogawa no Sho pros at their fancy Patio Daimon location, a collection of 14 'kura' earthen-walled storehouses that have been relocated to an area near the main entrance to Zenkoji Temple. Northern Nagano's soul food, 'oyaki', is basically a flour dumpling filled with various vegetables mixed with miso paste and soy sauce for seasoning. The fillings vary with the local and season but typical examples are eggplant, squash, leafy vegetables, northern Nagano's favorite pickled vegetable called 'nozawana', and others. There　are even dessert versiond stuffed with sweet adzuki bean paste or apple. Originally roasted in coals in an 'irori' hearth, nowadays the cooking method tends to be fried, steamed, fried-then-steamed, or other modern ways. 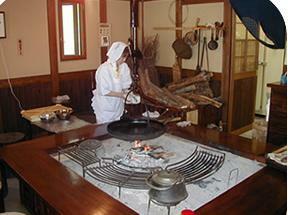 When in Nagano, especially the northern area, be sure to try eating 'oyaki'. And to get more out of your visit, how about trying to make the dumplings? Price includes making 2 oyaki dumplings. From Nagano Station(JR Hokuriku(Nagano) Shinkansen), Go north on Chuo Dori road 1.5km towards Zenkoji Temple. From Nagano IC, Follow the signs to Zenkoji Temple. Patio Daimon is on the SE corner of the R406 and Chuo Dori Road intersection.